UPDATED Sunday, 3;11 p.m. Updates with playoff information. Unionville's Tim Christopher comes down with his second interception of the game — clinching a 28-0 win over Kennett, Friday night. Unionville also locked up the No. 3 seed in the Section 1/AAAA playoffs and will host an opening round game. EAST MARLBOROUGH — It all comes down to timing. Lousy for Kennett and just about perfect for Unionville. Playing their most complete game of the season, the Indians improved to 9-1 and locked up a playoff spot, dominating the Blue Demons, 28-0, Friday night, while Kennett saw its remote postseason hopes die out with the loss. With the win, Unionville locks up the no. 3 seed in the PIAA District 1 AAAA playoffs and will host the no. 14 seed in the opening round of the playoffs. The Indians will host Neshaminy, Friday night at 7 p.m. in the opening round of the playoffs. At 9-1, the Indians matched the best record in District 1/AAAA — and while the team’s play has been uneven at times, clearly they have emerged as one of the top teams in southeast Pennsylvania in 2011. Senior running back Richard Sampson was once again a powerhouse for Unionville, running for 187 yards and three touchdowns. Jim Gill photo. While likely the best complete effort of the season, Clark said he didn’t think his team owed any apologies for posting a nine-win season — marred only by a tough loss to West Chester Rustin — and they should be proud of what they’ve accomplished so far. For Kennett (6-4), the best season since the program restarted in 2005 ended with a bitter taste. While a winning record and remaining in playoff contention until the final game represents major progress, Friday night indicated how much further the program still needs to go to reach elite status. Indians' junior quarterback Tom Pancoast was efficient, running for 60 yards on the ground, Friday night. Sean Helle photo. With his program — which has struggled since being restarted for the 2005 season — making great strides this year, the loss was a difficult way for it to end, he said. “We really wanted to end this season, which was a really nice, special season on a higher note than tonight and that’s disappointing.” Green said, who completed his second season leading the Blue Demons. 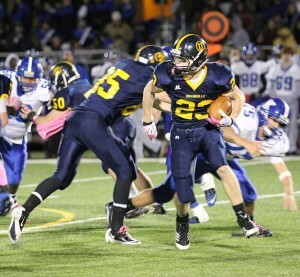 And while Richard Sampson had another elite game, rushing for 187 yards and three scores (giving him 1,444 yards and 20 rushing TD on the season), the story of the night was the Unionville defense, which totally stoned the high-powered Kennett option offense, picking up its first shutout of the season. The Blue Demons came into the game averaging more than 30 points a game and were left scoreless. 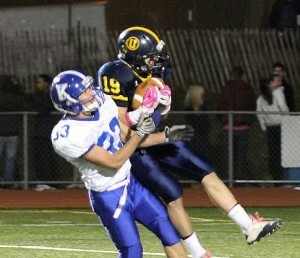 More telling: Kennett was held to a mere 102 yards of total offense and was dominated in time of possession. And what a difference it made having most of the pieces back in place — possibly inspired by the presence of Eagles‘ offensive lineman King Dunlop, at the game to make a scholarship presentation to former Indians player Norb Sax, as part of a breast cancer awareness program — the Unionville defense was nothing short of relentless. With Sampson healthy enough to play both ways — he had been nursing some minor nicks the last few games that restricted his snaps to the offensive side of the ball, and the return of Diehl, the Indians’ defense was as close to full strength as it had been in weeks, and it showed. 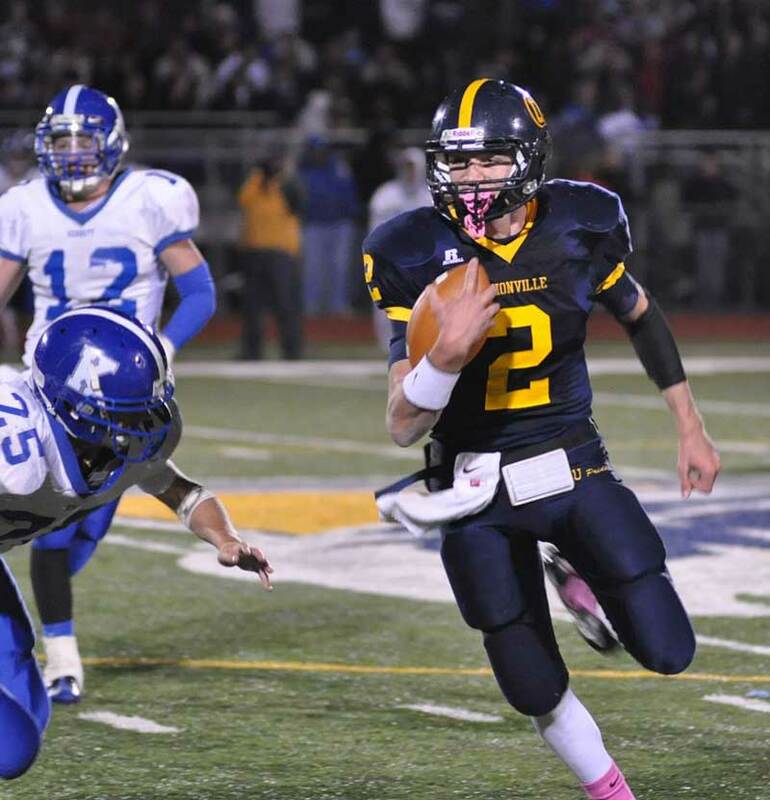 Between stopping the option run game of dangerous quarterback Barry Tomasetti Jr. (48 yards on 15 carries), Anthony Torrello (four yards on four carries) and Jordan Lardani (six carries, 34 yards), Unionville was also able to shut down the air attack, with junior defensive back Tim Christopher picking off a pair of Tomasetti passes. Although it didn’t show up in the stat sheet Matt Maggitti was dominant on defense, reading the option, stalking Tomasetti, and stuffing the run. Despite the lopsided score and stat sheet, there was no lack of intensity from either team — as the two schools are just a few miles apart on Rt. 82 and share a youth football program, the Kennett/Unionville Titans — as this is one of the region’s top rivalries. And in the early going, it looked like Kennett was going to be bringing it to their arch rivals. The Blue Demons took the opening kickoff and drove to the Unionville 21 before stalling and turning the ball over on downs. Then they were able to stop the Indians and force a punt. But that punt — a boomer by Chris Baker — buried Kennett at its own 1-yard-line. Forced to punt from its own endzone after a four-and-out, the Blue Devils gave the ball back to the Indians on the Kennett 35. 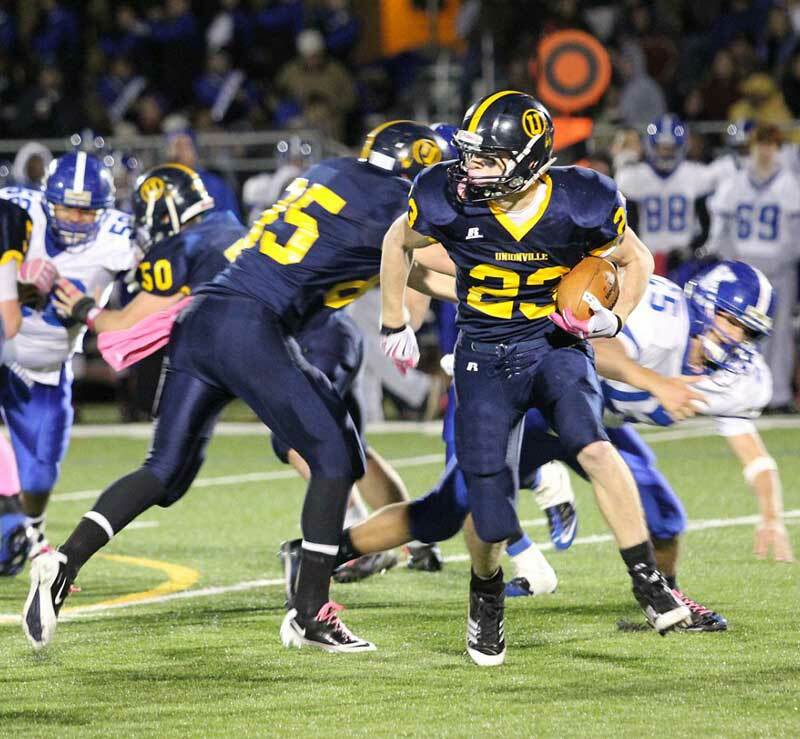 Only five plays later, Sampson powered the ball in from 11 to give Unionville a 7-0 lead. It looked like Kennett would respond in kind, taking the ball back and driving into Unionville territory — when Christopher picked off a Tomasetti pass. Not wasting the opportunity, Indians junior quarterback Tom Pancoast engineered a nine-play drive, capped by his 13-yard scoring pass to Doug Ott. Just like that, Kennett found itself in a hole, 14-0 — at the half, with Unionville getting the ball to start the second half. The Indians didn’t miss the opportunity to put the game away — starting the half with a methodical 10-play, 69-yard drive, capped by a two-yard run by Sampson, giving Unionville a 21-0 lead before Kennett even got a second-half possession. The Indians’ defense stopped the Blue Demons cold — actually pushing them back three yards — and forcing a punt. That’s when Sampson ended the game for all intents and purposes. His 53-yard romp down the right sideline was a crushing blow — and although Kennett didn’t quit, it was clear that going down 28-0 took the life out of the team. Great article, Mike! I have enjoyed them all year. Really enjoy your videos also. Your enthusiatic call of each game adds a lot to the production. Keep up the good work.